Caledonia is the more upscale property of the two Mike Strantz designed properties in Myrtle Beach. 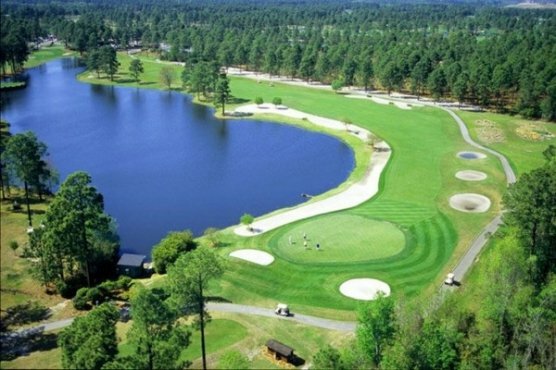 Ranked in the top 5 by Golf Digest Magazine of Top Public Courses in SC, and in the top third of the Top 100 Public Courses in America, Caledonia Golf and Fish Club is a treat for any golfer to have in their Myrtle Beach golf package. Both this golf course and The Dunes Golf and Beach Club are always atop the list of must play courses when you plan your Myrtle Beach golf getaway. Caledonia Golf and Fish Club has the ultimate low-country feel as it was built on a former rice plantation and features an entry that will rival the likes of a certain Augusta golf course. Like True Blue, it’s sister course just down the street, Mike Strantz created an impeccable golf course, but Caledonia has superior conditioning and a little more southern charm – this was the first design from the course architect and has a more traditional look and feel that True Blue, which Strantz designed 4 years after Caledonia. The signature hole of this 6500 yard, par 70 golf course is a fitting ending of this charming and beautiful course as the finishing hole is a wonderful 383 yard par 4. The trick to this par 4 is the length of the tee shot, as the longer strikers of the ball bring the water into play as the longer shot may run out of fairway. Once you have your tee shot in play, the approach shot must include a trip over the water and onto a green that is surrounded by 4 bunkers and the clubhouse. Most of the back of the clubhouse contains previous golfers that stick around for a while to watch those finishing their rounds hit their final shots into the green at 18. The fact that you are being watched by other golfers who have just finished their own round, can sometimes rattle even the most skilled of players. As a course filled of thoughtful shot making and well placed shots – the finishing hole is a perfect end to a beautiful strategic Myrtle Beach golf course. Expect a golf course that is well manicured and greens that are fast that the ball will roll smoothly on. Because of the water hazards take care in retrieving any golf balls that may land in them as the gators are sure to be lurking around at any time. With many of the holes being memorable, the par 3 9th hole will stand out as only 118 yards and not really fitting with the rest of the golf course. Add Caledonia Golf and Fish Club to your list of courses to play on your next Myrtle Beach golf trip and you will be playing one of the top ranked courses along the Grand Strand.